I work with the Agro Meteorological Assistance Programme, which teaches farmers how to adapt their farms to water shortages. The problem is that farmers no longer know when the rainy season starts exactly. Normally the rainy season starts around May and ends in October. Now it might rain few times in May, but the rainy season really starts later, sometimes as late as June or in July. Because of this change farmers may think it is the beginning of the rainy season when the first rains fall, and then they start growing the crops in their farms. They might have to do it several times because the wetlands dry up and the little plants die. The National Meteorological Service helps farmers to overcome this problem. Many farmers like me have been trained by the government to collect rainfall data which the specialists process to advise farmers when to plant. The data is broadcast daily during the weather bulletins from the national radio and TV. When a farmer follows the advice, he only sows the seeds on his farm once and wins time to do other work. In my village, people are very interested in what I do. Every time I go to the rain gauge near the village to collect data after it rains, people always want to know how much it has rained and they ask me questions. At the rainy season’s beginning some of them are so eager to know what’s going on they even follow me to the rain gauge. They don’t want to wait for the weather bulletins to be broadcast. People are interested in weather bulletins because they can help to improve our farming techniques. They tell us when we should start to farm and what seeds are adapted to the land and the rainfalls. They indicate the kind of work we can plan. For instance it’s not good to weed a farm when the rain is expected, because the uprooted grasses may not die. Weather information teaches farmers what species of crops can be used at the different periods of the rainy season. Thanks to weather forecasts we know whether a four-month cycle or a three-month cycle of crop must be used. After the rainy season we spend around eight months without growing any crops because it doesn’t rain. 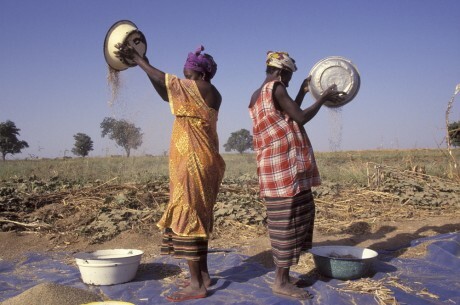 Women in Mali usually use this time to grow vegetables for cooking. Cooking is women’s business. If we can find water we can grow vegetables like tomatoes, okra, aubergine and onions. We dry the okra we grow in the rainy season for cooking in the dry season. We also buy vegetables like salads in the neighbouring villages where people have enough water to produce vegetables. Unfortunately in my village we don’t have enough water to grow vegetables. Some time ago, a group of helpers came here and created a garden where each woman in the village was given a plot she could use to grow the vegetables of her choice. The garden is now abandoned, for the well they drilled is always dry. Women can’t afford to walk the long distances to fetch water for the garden. If I could change things for my village I would bring clean water. That would improve our lives because everything is linked to clean water.